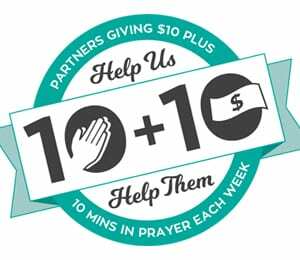 We are praying that God would raise up 400 partners who will pray for 10 minutes each week, plus donate $10 each week, to the ministry of GLO Australia. GLO Australia is a faith organisation run by volunteer workers who also serve by faith. GLO Australia does not deduct any money for its operating expenses from gifts that are earmarked for workers or specific projects. This means that GLO Australia passes on 100% of every earmarked gift to the worker or project specified. In 2016 approximately $210,000 was sent on general running expenses, such as gifts to faith workers serving in Australia ($63,000), Utilities & Rates ($39,000), Postage ($21,000), Insurances ($19,000), Motor Vehicles ($10,000), General Repairs & Maintenance ($10,000), and Equipment ($5,000) etc. GLO Australia is currently partnering with mission workers in over 10 countries, many of whom are actively involved in community development projects, evangelism, discipleship and church planting. At present we are also discipling and equipping trainees from 10 countries. GLO is providing scholarships to trainees from 6 of these countries. In order to keep providing help, GLO Australia is praying that God will raise up at least 400 partners who will help us help them.